All ovens cook with both convection and radiant heat, but what makes a convection oven different is that it cooks by circulating heated air with a fan. Convection ovens can be used for baking or roasting; roasting vegetables in a convection oven produces crisp, uniformly browned vegetables. Most recipes are for regular ovens unless otherwise specified, but they can be adjusted for a convection oven, which cooks more quickly than a conventional oven. To adjust a recipe for cooking in a convection oven, reduce the heat by 25 degrees Fahrenheit, or shorten the cooking time by 25 percent, or both. Select vegetables recommended for cooking in a convection oven, such as squash, peppers, onions, potatoes, mushrooms, cauliflower and carrots. Set the oven to 400 to 450 F.
Chop or cut the vegetables into bite-sized pieces, typically 3/4- to 1-inch chunks. Place the chopped vegetables into a mixing bowl. Add olive oil and herbs or spices and mix thoroughly with a cooking spoon. 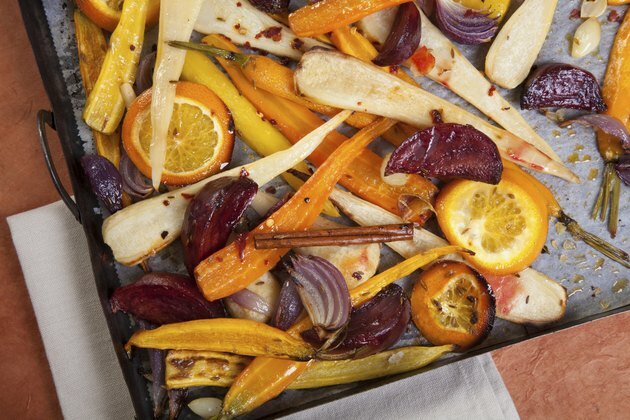 Place the coated vegetables in a single layer on a baking sheet. Place the baking sheet in the oven; cook the vegetables for 10 minutes, then stir and cook for another 10 minutes. Remove the baking sheet and vegetables from the convection oven. Place the vegetables on a serving platter and serve. Use a shallow baking sheet to allow air to circulate around the vegetables to ensure even cooking. Thoroughly coat the vegetables with the olive oil to keep the vegetables moist so that they don't dry out during cooking. Turn off the fan before loading the vegetables into the oven and when taking them out of the oven when they're finished cooking. Do not store plastic equipment or utensils in the oven as they could melt or catch fire. Do not cover the oven's racks with aluminum foil as it can impede air circulation.